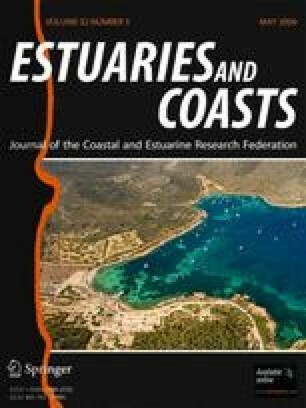 210Pb geochronologies of Cd, Cu, Hg, and Pb fluxes were obtained from the intertidal mudflat sediments of the coastal lagoons Chiricahueto, Estero de Urías, and Ohuira in the Mexican Pacific. The Cu and Hg sediment concentrations at the three lagoons fell within the ranges of 6–76 μg g−1 and 0.1 to 592 ng g−1, respectively; Chiricahueto and Estero de Urías sediments had comparable Cd and Pb concentrations within the ranges of 0.2–2.1 μg g−1 and 10–67 μg g−1, respectively; whereas in Ohuira lagoon, Cd concentrations were lower (0.1–0.5 μg g−1) and Pb concentrations were higher (115–180 μg g−1) than in the other lagoons. The metal fluxes (μg cm−2 y−1) for the three lagoons fell within the ranges of 0.02–0.15 for Cd, 0.7–6.0 for Cu, 0.001–0.045 for Hg, and 0.7–20 for Pb. The Hg pollution in Estero de Urías was attributed to the exhausts of the thermoelectric plant of Mazatlan and the metal enrichment in Chiricahueto and Ohuira was related to the agrochemical wastes from the croplands surrounding these lagoons. This study was funded by projects DGAPA-UNAM IX242504 and IN103605, and CONACYT-SEMARNAT 2002-C01–0161; scholarships to MDA were provided by CONACyT and DGEP-UNAM; mobility grants for MF and ACRF were provided by UNAM-CIC and CONACYT-CNR bilateral program for academic exchange. Thanks are due to H. Bojórquez-Leyva, L.H. Pérez-Bernal, Ramírez-Jáuregui, G. Ramírez-Reséndiz, and V. Montes Montes for their technical assistance. R. Parra and V. Carnero helped in AAS analysis. ACRF and MDA are grateful to M. Preda, S. Corbeil, and J. Hudon for their generosity and constant support during the academic stays at UQAM. This is contribution No. 1619 from the CNR-ISMAR, Bologna, Italy. CONABIO 2004. Comisión Nacional para el Conocimiento Uso de la Biodiversidad. Regionalización. http://www.conabio.gob.mx. INEGI. 2005. Cuaderno estadístico municipal Ahome, Sinaloa. Edición 2006. http://www.inegi.gob.mx. INEGI. 2006. Anuario Estadístico del Estado de Sinaloa, Edición 2006. http://www.inegi.gob.mx. Morales-Zepeda, F. 2007. El impacto de la biotecnología en la formación de redes institucionales en el sector hortofrutícola de Sinaloa, México. Tesis doctoral. Universidad de Barcelona. http://www.tdx.cbuc.es/TESIS_UB. NOAA. 1999. Screening quick reference tables (SQuiRTs). National Oceanic and Atmospheric Administration. http://archive.orr.noaa.gov/cpr/sediment/squirt/squirt.html. July 2, 2007.